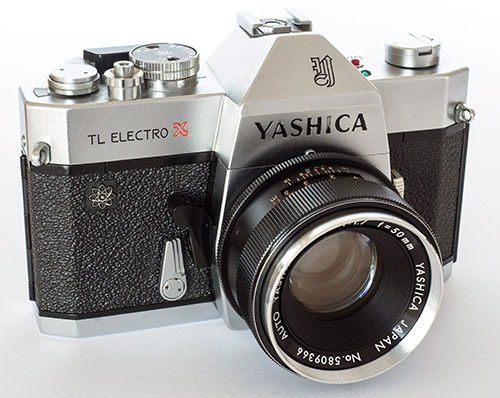 Until 1957, Yashima was a company building TLRs based on the Rolleicord design. Not much had changed since 1953 even though there were a lot of models. The variations mostly involved bought in shutters and lenses and how they were mixed and matched. Any improvements had been evolutionary rather than revolutionary. In that context, it is hard to imagine that the company had a large design and engineering staff, let alone one experienced in cameras other than TLRs. 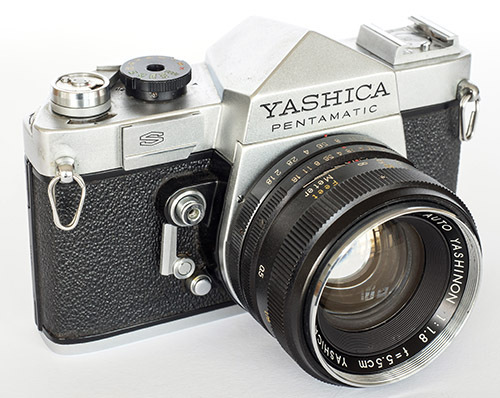 Yet from 1957 to 1960, Yashima/Yashica released the Yashica 8 movie camera followed by derivative models, Yashica 35 fixed lens rangefinder camera followed by derivative models, the Y16 sub miniature camera and its first SLR, the Pentamatic. It also managed to design and build three brand new 44 models. How was that all possible? By way of background, the Nikon F, released in April 1959, was an outstanding professional level camera from the outset but its development had evolved from the existing 1957 Nikon SP rangefinder model with the main new parts being the mirror box, pentaprism viewfinder and bayonet mount. 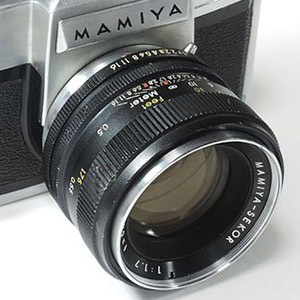 The Mamiya Prismat CLP released in 1960 had been eight years in development since the first Prismflex prototype in 1952. Designing an SLR from ground up in a little over two years and solving the engineering problems along the way, not to mention tooling up for a new type of camera and working with your lens partner(s) to develop a new range of lenses, would have been quite a challenging task for Yashica. 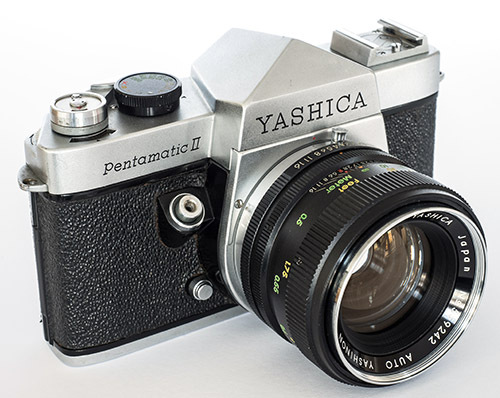 How the Pentamatic and other new models were developed is largely unknown but we can speculate that maybe Yashica had some assistance. There is certainly one big hint. 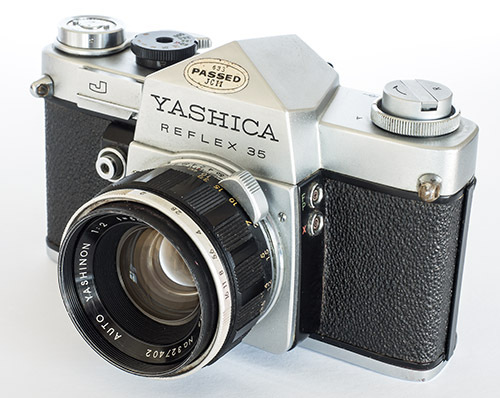 Yashica acquired Nicca Camera and its engineers in May 1958 so it had access to the basic structure of a focal plane shutter 35 mm camera and the people to develop it further. That much has largely been assumed but the centre panel of a Japanese Pentamatic brochure actually tells us that the camera was 3 years in development and unusually for Yashica, acknowledges the Nicca contribution by name. The big question is whether the 3 years is marketing speak for 1958, 1959 and 1960 (only 20 months from May 1958 to January 1960), or was the camera in development by Yashica or Nicca or jointly before the acquisition? 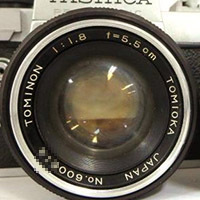 There was certainly Tomioka, Yashica's TLR lens supplier, whose Tominon brand appears on some of the Pentamatic accessory lenses and is believed to be responsible for at least the f/1.8 5.5 cm standard lens, if not perhaps the unusual f/1.7 5.8 cm on the Pentamatic II. 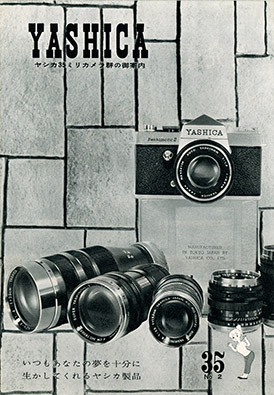 It is possible that Yashica also used the services of Konan Camera Laboratory, its technological partner for the Yashica Future 127 project in the same 1957 to 1959 time frame. However, the wild card is Zunow Optical Industry Co., Ltd. In development since 1956, Zunow launched its SLR in 1958. Its features pre-empted the Nikon F and included a removable pentaprism and a very significant world first, a fully automatic aperture diaphragm. Unfortunately, Zunow was too small a company to properly bring such a complex design to market and relying on many outside suppliers resulted in crippling quality issues and probably only 500 cameras or so were produced before the project collapsed. 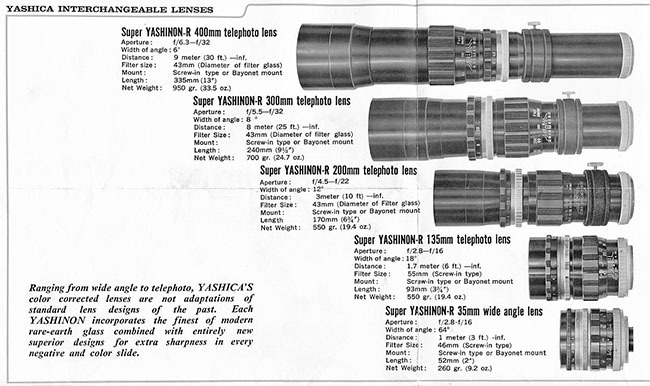 It is a little known fact that Zunow was Yashica's original cine lens supplier for the Yashica 8 movie camera and it may have supplied all the turret mount lenses (the name “Yashinon-V Zunow” still appears on the T3 lenses released in 1959). 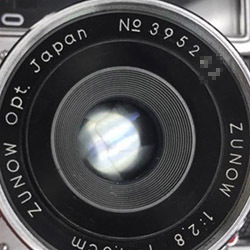 Further below is some speculation about Zunow's role with two 35 mm lenses. Did the cooperation extend further and Zunow contribute to the semi-automatic/ automatic diaphragm design of the Pentamatic cameras, or any other aspects? The possibility is certainly there but I stress, there is no actual evidence. 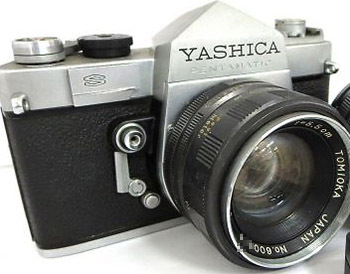 It should be noted that Yashica's claimed acquisition of the bankrupt Zunow happened in January 1961, i.e. after the release of the Pentamatic and Pentamatic II. Some Japanese bloggers see similarities between the appearance of the Zunow and Pentamatic but the reality is that the shape of the pentaprism is like, well like a pentaprism and is somewhat shared between the Zunow, Pentamatic and Nikon and the Nikon is certainly not related to the other two. 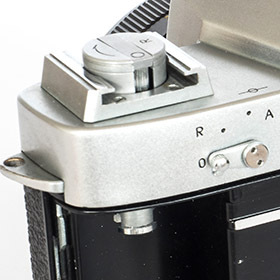 Also, the front mounted shutter button of the Zunow and Pentamatic is found on other cameras too such as the Contax S and various Praktica and Miranda models. On the other hand, there are some similarities with the cosmetics of the Zunow lenses and the Pentamatic ones. Co-operation, inspiration or coincidence? Together with the Mamiya Prismat CLP, it followed the 1959 Canonflex, Nikon F and Petri Penta releases which joined Miranda (Orion Camera Co.), Asahi Pentax, Firstflex (made by niche maker Tokiwa Seiki, also responsible for the 1955 Pentaflex with porroprism viewfinder), Topcon and Minolta Japanese made interchangeable lens pentaprism SLR models. The revolutionary Zunow had already been and gone. The release date for the historically rather important Pentamatic is contentious. Occurrences on the net are roughly divided between 1959 and 1960 with perhaps 1959 favoured, usually in conjunction with the word, “introduced”, however, there is another claim of a “Yashica/Kyocera sourced” date, March 1960. The Trademark filing date in Japan was 18 September 1959 and in the US, it was 12 February 1960. 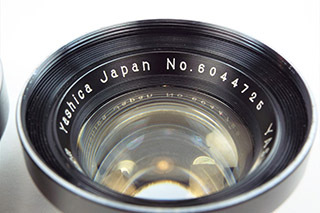 The official Kyocera Optec website of today lists Tomioka SLR lens production as commencing in 1960. Contributor Chris Whelan believes that he has decoded the Pentamatic serial numbers, with which I concur, and that the camera in the English language user manual is from December 1959, almost certainly a pre-production example. Series production seems to have commenced in January 1960. Release could have happened at any point from then on. An article by Hiroshi Sugawara in Japanese “Camera Collectors' News” of November 1999 claims that the Pentamatic was released in late January 1960. That would be in Japan. He also seems to make the point that it was common practice amongst Japanese camera makers at the time to announce their new cameras two or so months before the actual release which he takes to mean the first shipments to camera stores. That would make the initial announcement in October, maybe November 1959. Unfortunately, specifics are not provided. 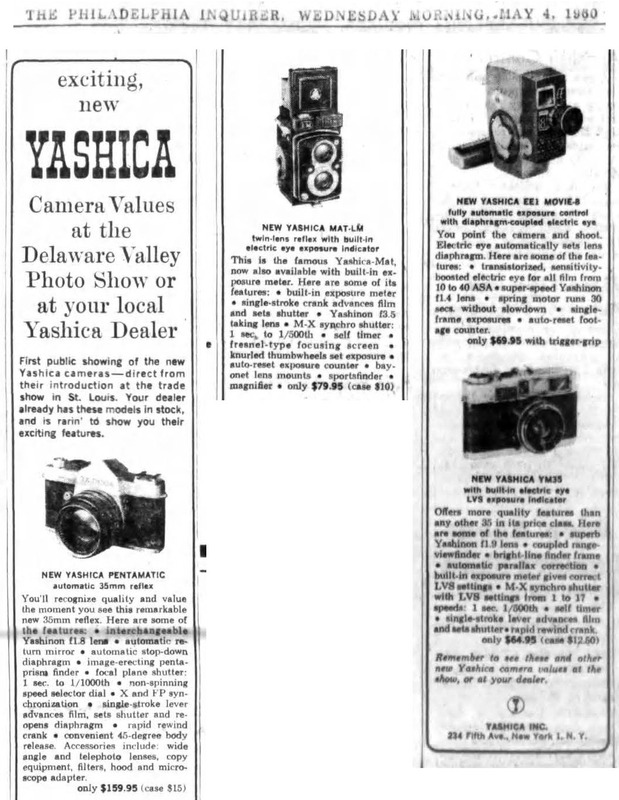 Meanwhile in the USA, page 48 of the Philadelphia Inquirer newspaper of 4 May 1960 contains an ad placed by Yashica which tells us that the new Pentamatic, and also the new Yashica Mat-LM (plus some others), can be seen at the Delaware Valley Photo Show, or “at your local Yashica dealer”, and this was “their first public showing” after the “introduction at the trade show in St. Louis” (note, the linked ad has been edited for easier viewing). According to Chris Whelan, this was “the 36th annual trade show of the Master Photo Dealers & Finishers Association convention in St. Louis, held March 21-25, 1960.” So announced late 1959, released in Japan in January 1960 and in the USA in March-May, depending on definition of “release”. The original model is the only one with evidence of worldwide sales and advertising. Chris Whelan and I have found ads and/or brochures from Japan, USA, Germany, France, Singapore and Australia. Although most Pentamatics found for sale or sold on auction sites are from Japan and the US, quite a few are from the UK. 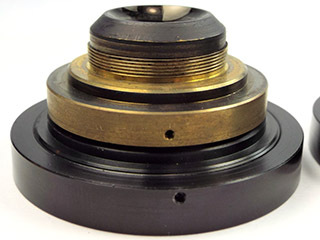 Nearly every reference source implies that the Pentamatic's “proprietary” bayonet lens mount was an impediment to the camera's sales success. Well, yes, but what has to be understood is that every successful bayonet lens mount, including the Nikon F mount, was/is “proprietary” and were usually accompanied by an ever increasing selection of matching lenses designed for the system. In 1960, the M42 screw mount was certainly common but far from “universal” yet with the main users being the East German Praktica and the Japanese Asahi Pentax with smaller West German brand Edixa and East German Contax (VEB Zeiss Ikon/Pentacon) already declining. However, the problem for Yashica was threefold; the lack of lenses on release, slow development of it's lens portfolio and the lack of automatic lenses. Much was made of the camera's automatic aperture diaphragm stop down ability but only the standard Auto Yashinon f/1.8 5.5 cm lens was “automatic” and even that was a marketing stretch - yes, the aperture diaphragm automatically stopped down at the time the shutter was released but the return of the aperture diaphragm to fully open for viewing was only accomplished by cocking the shutter again. At best, a compromise between fully “automatic” and manually cocked “semi-automatic” lenses, although admittedly state of the art only a year or two earlier on the 1958 Minolta SR-2 and some of the German models, but cameras such as the Zunow and Nikon F had already set the standard with others following. As noted below, the rare and short-lived Pentamatic II did feature a fully automatic aperture. This minimalist selection, without even a hint of more to come, must have set some sort of record for interchangeable lens SLRs and undoubtedly would have been a real disappointment for photographers who were looking to SLRs to extend their focal length reach over the limitations imposed by interchangeable lens rangefinders, for example. In comparison, when the small lens maker Zunow introduced its first SLR in 1958, it advertised four fully automatic lenses with another four pre-set types planned (three longer, up to 800 mm, and a macro). Admittedly, perhaps only three of the lenses were ever produced before the project folded but the point is that Zunow understood the importance of making available a range of lenses to meet customers' needs and customers were given what we understand as a lens map. When the Pentamatic S and first M42 models were released near the same time, a completely new set of T-mount lenses available with both Pentamatic and M42 mounts were advertised in focal lengths up to 400 mm (details further below), but still no wider than 35 mm. Better, but in comparison to major competitors, still a limited range. Incredibly, given the auto-aperture ability of the camera, all the accessory lenses of both series remained pre-set types. Note, all the lenses were marked in “cm” but advertised in “mm”, which makes writing about them difficult. I have mostly gone with what is marked on the lens. So either Yashica chose to not develop accessory lenses with automatic diaphragms for some management reason, or there were technical issues still to overcome with the implementation. Unfortunately, we don't know how Yashica's external lens supplier(s), assumed to be Tomioka in the main or exclusively, fitted in. 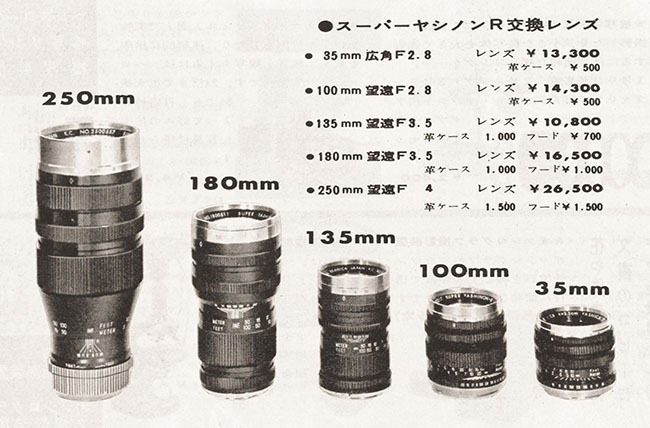 As noted above, Tomioka had not produced SLR lenses previously, and interchangeable rangefinder lenses are an unknown (there is no certainty regarding the relatively low volume YE and YF lenses of which at least one of the normal lenses and one of the two telephoto lenses was made by someone else). These required relatively complex machined barrels plus the addition of aperture diaphragm mechanisms, not to mention the “automatic” aperture of the standard lens, compared to the threaded tubes of TLRs and usually simpler leaf shutter viewfinder/ fixed lens rangefinder cameras that were Tomioka's bread and butter at the time. Like Zunow before it, Yashica did offer adaptors for Praktica M42 screw and Exakta bayonet mount lenses right from the beginning (already featured in the user manual) but these were manual operation only and like Yashica's own preset lenses, they could not use the camera's headline automatic aperture stop down feature that customers were paying for. Compared to competitors, two other annoying quirks that were likely due to cost cutting were, when loading film, the need for manual frame reset with an easy to accidentally move toothed wheel and the lack of a self-timer which was finally added in the S model (bizarrely, the original user manual shows the use of a Walz branded accessory timer - at various times in the then past, Yashica had offered “Yashica” branded items). The toothed wheel seems similar to the equally problematic version found on lever wind Leotax Leica copies. I don't know if Leotax “owned” the design but Leotax was Nicca's arch rival, and by extension, Yashica's in regard to the the YE and YF. 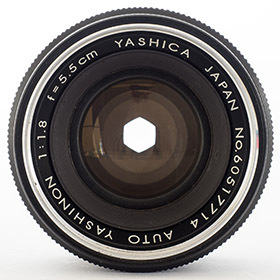 However, Yashica did rebadge one of the three versions of the Leotax Leonon lens as the ultra rare f/2 5 cm Yashikor fitted to some YFs so maybe there was more going on than meets the eye. Ironically, Yashica had endowed its first 35 mm camera, the Yashica 35 released in April 1958, with an automatically reset film counter and included the feature on the 1959 Yashica YL too. Both these were lower priced cameras. 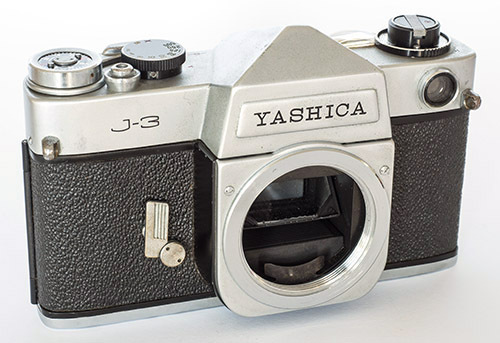 Then Yashica discarded the automatic reset of the Nicca III-L in the process of turning it into the YF. It seems that Yashica had decided that the cost was not worth the benefit. This lens is comprised of 6 elements in 4 groups (schematic in Pentamatic S brochure). The filter size is 52 mm and conveniently, all lenses for the Pentamatic are claimed to be the same (note, as implied by the Pentamatic II user manual in regard to the 54 mm slip-on lens hood, that may only apply to the first lenses, the 3.5 cm and 10 cm, besides, I doubt that both the 13.5 cm f/2.8 and f/3.5 are the same as each other and it is certainly not the case with the black nose lenses released with the Pentamatic S - see Pentamatic Lenses below). 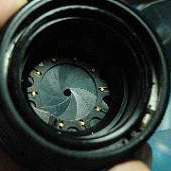 The number of aperture diaphragm blades is either 6 or 9. There are three main serial number ranges, the earliest starting with 5910 and 5912 and the last with 605. Strangely, an early lens, owned by contributor Chris Whelan, with serial number 59100092 features 6 blades, however, slightly later lenses, 591001xx and 591005xx, feature 9 blades as seem to all lenses with serial numbers beginning with 5912. Lenses beginning with 6050, 6051 and 6052 (the majority and also including all original fitments for the Pentamatic S) are back to 6 blades. The table below provides some 1960 and 1962 prices in the US plus key specs of comparative Japanese SLR models. Note, from serial numbers, it looks like the last Pentamatic was made in January 1961. By February 1962, the last examples were being advertised in Modern Photography at the fire sale price of $94.50, therefore the August 1962 Popular Science table is certainly out of date. An Olden Camera Co., New York, ad for the Mamiya Prismat NP released in February 1961 advertised it at $118.50, illustrating what a bargain price might look like. The top speed of 1/1,000 and Canon Exakta mount f/1.9 lens made it competitive. Like Yashica, Mamiya was trying to break into the 35 mm SLR market - this was the company's second model. The November 1999 “Camera Collectors' News” article by Hiroshi Sugawara, mentioned above, makes reference to the June 1960 edition of Japanese magazine “Asahi Camera” which reported on the results of a disassembly, inspection and testing of a Pentamatic in its camera assessment lab. This was jointly undertaken by celebrated Japanese photographer Mr Ihei Kimura, Professor Jun Koizumi from Tokyo University and camera repair technician Mr Tsui Uchida Yukichi. By way of background, Hiroshi Sugawara explains that in Japan at that time were the high-end SLRs, such as the Nikon F and Canonflex, costing 60,000 yen or more and the middle class SLRS around 30,000 yen (the Pentamatic ads price it at 34,800 yen plus 2,000 yen for the ever-ready case). This is where he places the Pentamatic but “one step higher” because of the 1/000 shutter (in comparison to those models with 1/500 shutters). He also notes that the camera was advertised as being able to use other mount interchangeable lenses by use of dedicated adaptor rings but a consequence of this design was a short flange to film plane distance necessitating compromises with the mirror size and mechanism, an aspect which elicited negative comment by the review team. On a positive note, “the pentaprism is firmly fixed to the body with springs from both sides, a metallic protective plate is attached to the top of the pentaprism... die casting of the body is good in finishing accuracy”. There is also reference to “the focal plane shutter made by the Nicca engineers”, I'm not sure in what context but certainly positive and also confirming the importance of the Nicca acquisition to the project. However, the top speed of the shutter tested slow at 1/700 but the 1/500 and 1/250 speeds were accurate. The lens was also assessed, “Tomioka Optical made Auto Yashinon 55 mm f/1.8 (4 group 6 element type) has a large opening efficiency of 65%, the resolution is excellent, but the lens barrel is too heavy. Focusing is from infinity to 0.5 m.” Testing found ghosting with bright point light sources, particularly at night. A problem was found with the aperture blades which would not fully open beyond f/2, perhaps this was a reason for the change from 9 aperture blades to 6? Finishing off, Hiroshi Sugawara comments that the front mounted shutter button is easy to use and in his view, helps with reducing camera shake, but importantly, he notes that in Japan it was not popular and it was not a “hit” with Topcon, Miranda or Petri either. So what does this evaluation by Hiroshi Sugawara and the Asahi Camera team mean? There was both good and bad. For a first completely new camera type from a maker, not just a new model, there was plenty of good with some opportunities to improve, nothing disastrous. Any product is a compromise between features, quality and price so the only meaningful way for us to make an assessment is look at how this review compares to similar reviews of the Pentamatic's competitors. The fully automatic aperture stop down and opening is controlled by the camera and also works with the earlier f/1.8 5.5 cm lens (I have tested both). It seems to have only been advertised in Japan and all found examples are from Japanese auctions and websites. A Japanese brochure featuring both models advertises the Pentamatic at ￥34,800 plus ￥2,000 for the ever ready case and the Pentamatic II at ￥37,300 plus ￥2,200 for the case. The fact that it lasted barely four months and didn't make it out of Japan suggests that there was a management decision about the future of the series, an inherent design or reliability problem, or that there was a lens supply issue as suggested further below. Yashica was not a niche player and a completely new high quality lens would have come at some cost and is very odd to have been abandoned so quickly. Because of the self-timer positioning, the shutter button was now horizontal. Most found examples are from the US with a small number from Japan (four plus one box bought by contributor, aficionado and collector Chris Whelan). Even so, one Japanese blogger claims that the model was for export only and no Japanese ads or brochures have been found by Chris. He has one US system brochure for it and another where it appears with the Penta J and J-3 M42 models. There was an ad for the camera run at least twice, once in Popular Photography (page 90, date unknown) and the second in an unknown publication (it adds a Canadian distributor's address) and it also appears with other Yashica cameras in the 14 January 1962 edition of LIFE magazine. 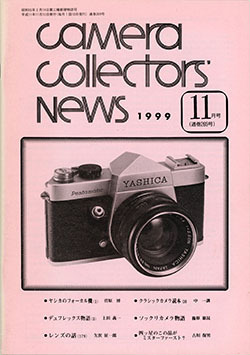 The article in Japanese “Camera Collectors' News” of November 1999 referred to further above is about the Pentamatic models but only mentions the original and the Pentamatic II so perhaps the Pentamatic S was only released in the US and the examples found in Japan have been returned by collectors, apparently not an uncommon event, and perhaps by military personnel as they moved to and fro and traded/upgraded gear. The “S” could stand for Split-prism rangefinder focusing (according to a Japanese blogger, suggested in an unnamed book), Shutter coupled exposure meter, Self-timer, all three or something else entirely. 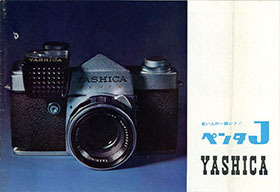 Yashica's US brochure and ad concentrate on the ease of focusing (shared with the Penta J below). The Japanese user manual for the Pentamatic II mentions the availability of five accessory lenses but the English language Pentamatic S manual reuses the page from the original Pentamatic manual and therefore implies that apart from the standard lens, the additional lenses available are limited to the original 35 mm and 100 mm! In fact, even that was incorrect, the accessory lenses for the Pentamatic and Pentamatic II were completely replaced by an entirely new set, see Pentamatic Lenses below. The US price was “under $200 plus case”, so a premium of $40 over the original model, not exactly cheap for the specification. The clip-on exposure meter was $25. The last example in my database is from March 1962. The name “Penta” makes sense as the aperture diaphragm is now not automatically cocked so the “matic” has been dropped but what does the “J” stand for? Nobody is absolutely certain but the two known Japanese ads have ジャガー written across the “J”, meaning “Jaguar” (first identified for me by contributor Chris Whelan and also noted on several Japanese blog sites), however, “Jaguar” is not featured in the above brochure. Are the admen playing with us, or is that the real name, noting that the “Lynx” rangefinder was released in 1960? The Penta J was followed in late 1962 by the J-3 with built-in CdS exposure cell below the rewind crank, re-instated self-timer and shutter button on top of the camera. The normal lens remained the same. A US brochure from the end of 1962, or beginning of 1963, features the Pentamatic S, Penta J and J-3 together. As far as I can tell from various sources and also serial numbers, the other M42 cameras followed in this order: J-5, J-P, J-4, TL Super, J-7, TL, TL Electro-X, TL-E, TL Electro-X ITS, TL Electro, Electro AX and FFT. There was also a TL Super rebadged as a “Porst Uniflex 1000s” for a West German distributor and US department store, Montgomery Ward, offered two Yashica based models under its own brand. These appear to be specials using an amalgam of parts. The first was the “Wards SLR 500” which seems to be based on the J-P with its distinctive CdS meter mount but without the self-timer and the film advance lever replaced by the Penta J type with manual counter reset. The “Wards SLR 600” seems to be based on J-7 (or more probably, the uncommon J-4 - same body but 1/500 top speed) but retains the Penta J film advance. I haven't seen the 500 lens but the 600 uses a cosmetically updated version of the Penta J manually cocked semi-automatic f/2. With the release of the Contax RTS and advent of the Contax/Yashica bayonet lens mount in 1975, production of remaining M42 models ceased except for the lower spec TL Electro which seemed to soldier on until 1978 or so, perhaps as an entry level model and/or to keep faith with existing M42 customers. 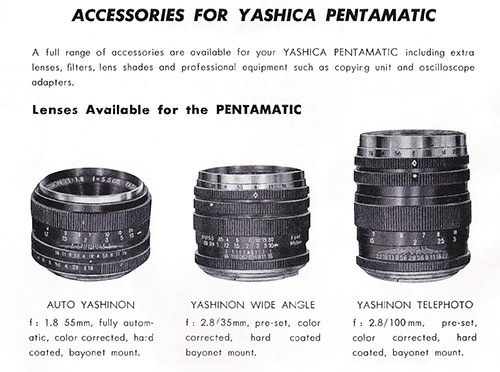 In the US brochure, the Pentamatic S was advertised at “under” US$200 and the Penta J, at “under” US$130, firmly back in the more budget mass market territory that Yashica was familiar with (the original Pentamatic had been advertised at US$159.95). The ensuing models remained well built but were comparatively ordinary until perhaps the late 1960s TL Electro-X with electronically controlled shutter. Sales were also relatively lack-lustre. 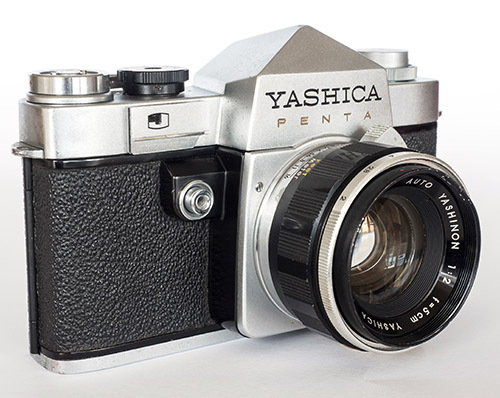 To me, it seems as if the Pentamatic was designed by engineers who understood what was necessary to compete in the SLR market as it was developing but that it didn't really fit with the TLR marketing strategy that made Yashica successful - high volumes at low margins through good quality at prices that others could not match. With other new products at this time, this still seemed to be management's guiding principle whereas the Pentamatic was somewhat in the middle with specs and the price, whilst good value, was not a bargain. And of course, there was also the worst lens availability of any comparative model. There was no pretense of professional aspirations but it seemed to be developed with enthusiasts in mind whilst perhaps management was looking for a product for the mass market consumer. To some extent, this is reflected in the advertising material which continued to focus on the value aspect and is rather lacking in technical interest, as are the English user manuals, compared to other brands hungry to get their models noticed by “photographers”. The Pentamatic was not perfect but certainly seemed to have promise which was not realised for one reason or another. To make a change this early on with only low production volumes suggests some sort of issue rather than just a minor ergonomic improvement, if it is that. 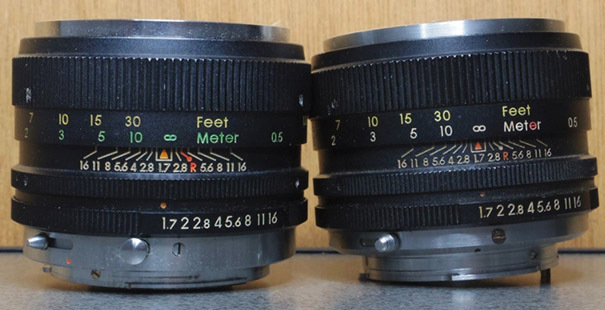 As noted earlier, only the 5.5 cm f/1.8 and 5.8 cm f/1.7 standard lenses were pseudo-automatic/automatic (depending on body), all the accessory lenses were of the pre-set type. The table below lists the lenses by focal length which is also pretty close to the chronology of the original lenses. The accessory lenses are split into two separate groups; the silver nose (what we might call “first series”) released progressively with the Pentamatic and Pentamatic II and the black nose (what we might call “second series”) released with the Pentamatic S and first M42 models and which in Pentamatic mount completely replaced the first series. The accessory lenses mostly use the focal length as the prefix for the lens serial number. The main exceptions are the second range of the first series 3.5 cm f/2.8 Yashica Tominon Super Yashinon-R which begin with “364”, the second series 3.5 cm f/2.8 Yashica Super Yashinon-R (uses aperture instead) and the one example of the 10 cm Yashica Super-Yashinon which uses a number similar to the standard lens format and is presumed to be an early type but was found with the Pentamatic S and Tomioka lens below. The first series 13.5 cm f/2.8 lenses mainly feature the focal length in the format of “1355xxx” but there is one early exception, 1328xxx, and the second series starts with 1380xxx but then seems to change to 1351xxx, i.e. the same as the second series f/3.5 type (I have double and triple checked all details). The one 5.5 cm f/1.8 Tomioka Tominon found with the earliest Pentamatic S (with very low pre-production like number believed to be made in February 1961 when the very next camera is from April when series production seems to have started) is a complete mystery. There is no way of telling whether it is original to the camera. 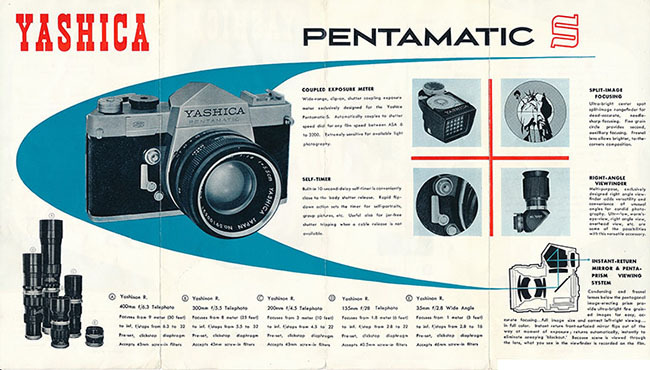 The 13.5 cm f/3.5 does appear in a later brochure featuring the Pentamatic S and Penta J and J-3 M42 cameras. That brochure also mentions a 90-190 mm zoom lens available in either mount. I think that the first series and second series images in the brochures and the differing focal lengths and filter thread sizes (see table below) make it very clear that the lenses are not related. 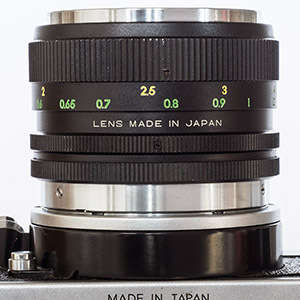 Several of the first series lenses have the “Tominon” name included and the slow release of lenses is consistent with Tomioka getting up to speed designing, tooling and making its first SLR lenses (in accordance with its own claims). 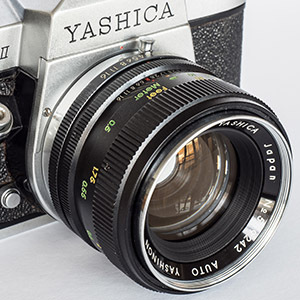 The abrupt change of direction by Yashica seems to have resulted in recognition of the need for a longer lens as well as a desire for lenses to suit either mount and to be available immediately. I suspect that by this time, Yashica knew that the Pentamatic and its mount were on borrowed time and maybe the wholesale move of Pentamatic lenses to the interchangeable mount series was to allay the possible ill-will from people buying a lens for their Pentamatic only to be stuck with an unsupported mount in the future? Having designed one set which was completely different, did Tomioka design and make these too? I doubt it. Compared to the 20 cm Super Yashinon-R in the brochure, the only difference is that lens hood is unscrewed and the lens focus has been cranked out to a relatively near position instead of infinity. The bayonet mount type is unknown. The Tokyo Koki Co., Ltd., maker name appeared on the Tele-Tokinas and Minetars but they were sold as various other brands as well, e.g. Lentar seems fairly common in the 20 cm size at least and also Hanimex. 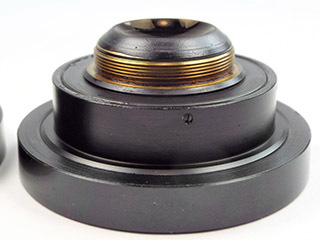 Once automatic diaphragms became popular, their proprietary actuating systems removed the attraction of the T-mount except for the most basic of lenses. Yashica then moved on to its new line of M42 lenses but interestingly, the 30 cm/300 mm version with T-mount from the above brochure still appears as a budget option to the auto version in the Yashinon-DX lens catalogue, which by now presumably featured mainly Tomioka made lenses again. A little further above, I also mentioned a zoom lens appearing in a very late (for the Pentamatic) brochure. This is the Yashinon-R f/5.8 90-190 mm. The first zooms for still photography were just starting to appear at this time. 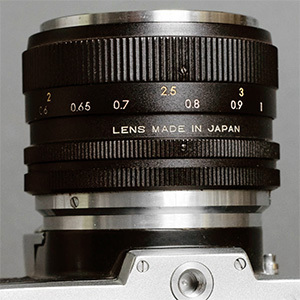 A similar zoom appears in the Ricoh catalogue and as Tomioka was known to have made lenses for Ricoh as well as Yashica, some think that it is a Tomioka lens. Others have attributed it to Tokina. There were certainly plenty of brands using it. As well as Yashica and Ricoh, found examples include Beroflex and Polaris in M42 mount, Soligor in Canon FD mount and Upsilon in Minolta mount and Hanimex in an unknown bayonet. In all likelihood, the non-camera makers offered it in all common mounts and there are probably other brands as well. 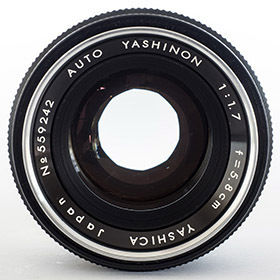 Some later versions feature an auto aperture - in the case of Yashica, the lens became an Auto Yashinon. By the time of the DX catalogue, it had been replaced by a new Auto Yashinon-DX f/4 80-160 mm zoom. My personal view is that the maker remains unknown - I have not seen any hard evidence, just opinions. 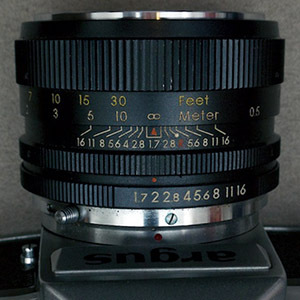 This example is fitted with the 5.8 cm f/1.7 standard lens from the Pentamatic II . One other not so well known mystery is that why Yashica, having decided to embrace the M42 mount and refer to it as the “Praktica” mount, it then chose to deploy it using the aberrant Edixa implementation of rotating the mount clockwise by some degrees. Note, the rotation is not related to the lens register as claimed by some, that remains the same. Edixa's reasons are presumed to relate to the external diaphragm coupling on some of its lenses. Yashica didn't use external coupling and seems to have had no reason whatsoever. This was brought to my attention by correspondent John Farrell who noted that “the lens from a Yashica Reflex 35, fitted to a Pentax SV, has the focusing index mark at 11 o'clock - and a Pentax lens on the Yashica, has the mark at 1 o'clock.” There are posts about this on the net and I have also confirmed this behaviour but with a Takumar on a later TL Electro-X, the rotation was closer to 2 o'clock. Manual lenses are unaffected, apart from the normally centered scales being oddly offset, but with automatic and pre-set lenses, the issue is about the ability of the striker bar just inside the camera lens mount at the bottom to hit the stop-down pin when Edixa mount and non-Edixa mount cameras and lens are mixed and matched. Usually, it is not a problem but nevertheless, it is a decision that defies explanation. 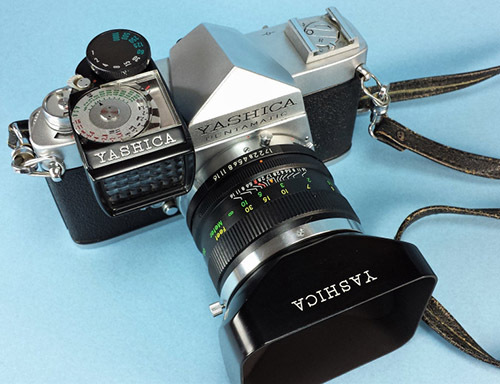 Note, Yashica M42 bodies designed for semi-automatic lenses, i.e. Penta J, Reflex 35 and J3, use the striker bar to simply trigger the manually cocked lens aperture diaphragm whereas bodies designed for fully automatic lenses use the bar to push down the stop-down pin, hold it down and then release it after the shutter closes. 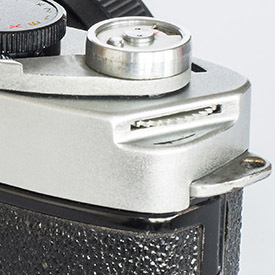 On the earlier bodies, the bar is directly connected to the shutter button and even if the shutter is not cocked, the button can trigger the diaphragm to fire and close the aperture down. On later bodies, the shutter must be cocked first because the camera body does the work, the lens merely providing a spring to keep the aperture blades in a naturally open position. The two systems look similar but work quite differently. Using later fully automatic lenses on the earlier bodies means that the aperture will not close down. That is especially problematic for Yashica lenses which don't have a Manual/Auto switch, unlike Asahi Optical Co. Takumars, for example. On the early Lynx lenses, “Number” is abbreviated as “No” (note, no period, or full stop). Also, the lower case “a” is different. Early Lynx lens front group on left, later on right (all later lens numbers are 7 digit, starting with “5” or “6”). The front element also sits deeper in the left early example and there are other physical differences inside. 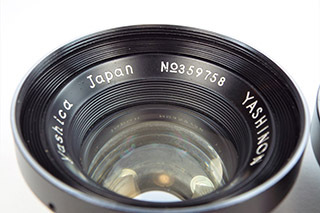 There are only two other Yashica lenses featuring this style (with both, the “No” and different “a”). The first is probably a big surprise when I say it is the lens fitted to the Yashica YL. Actually, it isn't likely another lens, it is almost certainly the same one. 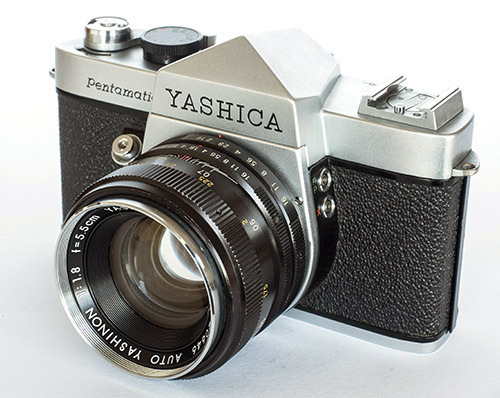 The wikis and other sources will say that the YL was available with either an f/2.8 lens or an f/1.9 lens and these are widely believed to be the same as fitted to the original Yashica 35. Yes, but this camera is also found with two f1.8 lenses, one with text like the left lens of the pair above, the other with text like the right lens. Of 42 cameras I have found, 12 have the f/2.8 lens, 9 have the f/1.9, 17 have a similar lens to the left f/1.8 example above and 4 have a lens like the right one. More at Yashica YL. The DoF preview button is interesting. Once pressed, it stays stopped down, even after releasing the shutter. 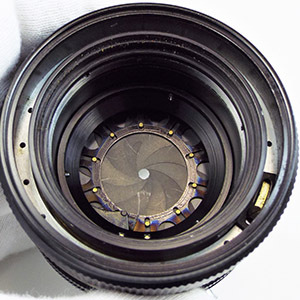 To re-open the aperture diaphragm to its normally fully open position requires operation of a sliding switch next to the button. 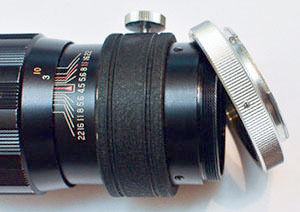 This two stage operation also featured on at least the standard lens for the Zunow SLR. Another thing about most “Yashica” 35 mm lenses is that they tend to have longer serial numbers, 7 or 8 digits, often starting with a descriptor number that usually gives a clue to focal length, occasionally a clue to aperture and with some early lenses, perhaps some date information, e.g. Pentamatic f/1.8 5.5 cm lenses begin with 5910, 5912 and 605 which may be related to 1959 and 1960 and perhaps even months in some way (October 1959 could be finalisation of the lens design, lenses starting with 605 reverted to 6 blade aperture diaphragms and first appeared fitted to May 1960 produced Pentamatics). The descriptor number is followed by a cumulative sequence number which counts up from zero and is continuous without breaks. The f/1.8 5.5 cm lens serial numbers suggest a total of just over 20,000 made which is about the same as the total of Pentamatic and Pentamatic S cameras. Zunow numbers tend to be shorter and all the digits appear to be part of a sequence number which counts up from some arbitrary point but it is more complicated than that. The f/1.7 5.8 cm lens serial numbers range from 424xxx to 595xxx but with quite a big gap in the middle - my database contains number ranges 42xxxx to 43xxxx and 55xxxx to 59xxxx and gaps elsewhere. The total number of lenses produced was perhaps less than 6,000, see Serial Numbers & Production below, considerably less than any interpretation of the serial numbers suggest. Both the early Lynx lens and the f/1.7 5.8 cm lens seem more Zunow-like than Yashica-like in numbering style. Is it merely coincidence that both lenses disappeared at about the time of Zunow's bankruptcy? In all honesty, I can't answer that but it is worth thinking about. Even if Yashica acquired the remains of Zunow, there would have been a bankruptcy process and creditors wanting some return on their outstanding debt, therefore access to Zunow's plant and other resources could have been delayed for a lengthy period necessitating a change in Yashica's production plans. Note, some sources claim that the Argus mount is different to the Mamiya but I believe that is incorrect. The people that make the claim seem to be unaware of the Prismat WP. For the first production Prismat (according to Japanese Wikipedia, the little-known Prismat CLP, an export only model released in January 1960) and the Prismat NP, Mamiya used the German Exakta mount. There was a move apparently by at least some Japanese companies to use a standard bayonet - that fell through but Mamiya used it on the WP (Sugiyama calls it “special mount”) and I also believe on the rebadged Argus variant (there are some suggestions that it was also the bayonet mount used by Asahi Optical Co., Ltd. on the 1960 Pentax Spot-Matic and Metalica prototypes). Like Yashica, the following Mamiya models adopted the M42 screw mount. Apart from being bayonets, as far as I can tell, the Yashica and Mamiya WP mounts are quite different, e.g. the film plane to lens mount flange distance of the Pentamatic is 43 mm and the Argus (also I assume the Prismat WP) is 44.45 mm. The only obvious differences between the left and right lenses above are the bayonet mount, the colour of the scales (the scales, their placement and fonts themselves appear identical) and the Pentamatic II lens has a button on top as well as a sliding switch on the side whereas the Prismat WP and Argus lenses don't have the button but have the same switch in the same place as on the Pentamatic lens (the knob has a less pointy profile on the Sekors and on those, in the photos is sitting at the opposite end of the slot to the Yashica lens). On the Auto Yashinon , the button stops the lens down for DoF preview and the sliding switch re-opens the aperture diaphragm fully whereas the Sekor switch combines the functions in a more commonplace implementation. All the lenses have 52 mm filter threads, 10 bladed aperture diaphragms and an aperture ring that spins the same way (there was an earlier Exakta mount Mamiya Sekor f/1.7 58 mm with 9 bladed aperture diaphragm, an aperture ring that spun in the opposite direction and an external shutter coupling - the appearance of this was quite different). Yashica advertising tells us that its lens is comprised of a fairly standard 6 elements in 4 groups, Japanese Wikipedia confirms the same for the Mamiya-Sekor. Whose design it is and who made it are complete unknowns but if it was a Zunow design, it is possible that the original tooling etc was re-used, perhaps by Tomioka via Yashica, or even by Mamiya via Yashica. Note that there is no hard evidence that it is not an original Tomioka design, just circumstantial differences. Although possible, it is unlikely to be a Mamiya sourced design as it appeared on the Yashica first and follows the signature Yashica Pentamatic lens style. The subsequent Mamiya Sekor M42 f/1.7 58 mm looks completely different but the 10 bladed aperture diaphragm and aperture ring direction are retained so the two generations may be related. 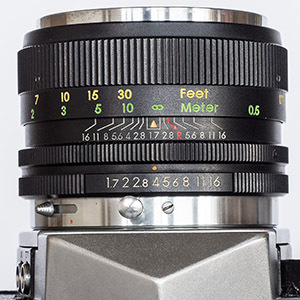 As far as I am aware, the combination of f/1.7 aperture and 58 mm focal length is also limited to the Pentamatic II lens and the three different mount Mamiya lenses. The Argus user manual has details of f/2.8 35 mm and 135 mm Argus-Sekor lenses with fully automatic aperture diaphragms. I can't tell much from the low resolution images but they appear to share physical characteristics with the standard f/1.7 58 mm lens. Japanese Wikipedia also mentions companion Mamiya-Sekor versions for the Prismat WP. So the intriguing question is whether they are newly Mamiya designed and made or share the same source as the standard lens. They could have been designed for the Pentamatic without ever going into production. With only the standard lens and the one wide angle and one telephoto, it is hardly surprising that the Prismat WP and Argus are at least as rare as the Pentamatic. Note, prior to the Prismat WP and Argus, Mamiya released the Prismat NP, still with the original Exakta mount and external shutter coupling but with the standard f/1.9 50 mm lens made by Canon complete with Canon markings. There is some debate about whether or not Mamiya made its own 35 mm lenses but clearly, it didn't make all of them. Whilst much of this is guess work, the existence of the nearly identical lenses used by two different camera makers and possible Zunow connection are part of the greater Pentamatic mystery. The Penta J and Reflex 35 are basically the same camera and should be considered together. Whereas the Pentamatic numbers must have disappointed Yashica, the attempted updates fared much worse. Even the M42 models must have been a disappointment remembering that Yashica's sharp pricing relied on volume for profit. There is not much information available on the Pentamatics, or indeed the early M42 models. 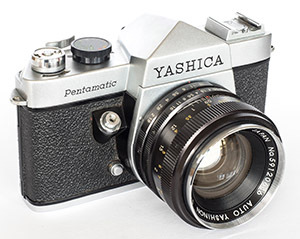 The best collection of information, including photos, brochures and ads is on my friend and contributor Chris Whelan's blog site, Yashica Pentamatic Fanatic at https://yashicasailorboy.com/. Look at the sidebar in “Categories”, or just enjoy the read. Chris and I have our differences of opinion but we are on the same wavelength and his discourse is lively, entertaining and intelligent. There was a reasonably complete collection of Yashica SLRs at www.captainchaoz.talktalk.net together with other 35 mm and related models and Yashica items. Unfortunately, the hosting site was shut down in August 2018. I don't know whether the content will reappear elsewhere.